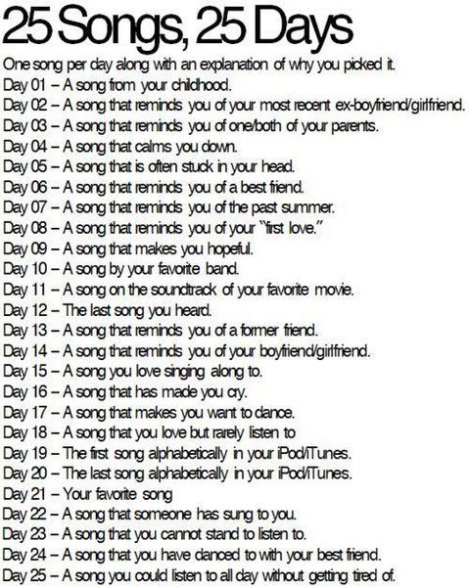 Day 7 – A song that reminds you of the past summer. I spent half of last summer waiting for Male to leave. The other half was spent mourning his loss as he went off to law school in another state. It seems like he’s been gone a million years and I haven’t seen him in forever, which is partially true. I haven’t seen Male since last summer and this summer is approaching fast. Now, he’s almost done with his first year in law school and on May 29th, I will get a giant bear hug from a giant bear. He’s coming home. Well, at least for a little while before he goes off to China (don’t ask). 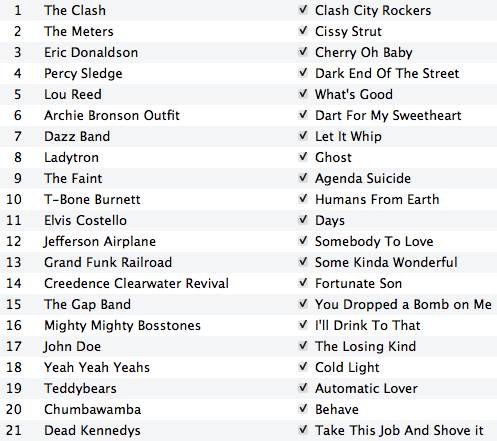 Right after he left, I listened to that mix obsessively. It’s full of inside jokes, and subtle and not so subtle messages. I’m glad you’ll at least get to see him soon, even if it is just a brief visit. Ha! I’m just glad you’ll have that. I can only imagine how much you’ve missed him. I’ve gotten used to it. I just don’t like thinking of those first few weeks. That sucked. Okay, then we can discuss something else. Um…how’s the weather? It’s getting up to the 80’s here. Sigh, I want winter back. Ha! At the dog park the other day, I was complaining about it being hot and one of the people there said, “weren’t you just complaining about it being cold?” YES! I’m a temperate sort of girl. I don’t like extremes of any kind. Me either!! Give me year round autumn and I’ll be just fine. Or winter without the polar vortex. Yes. I would be super happy with fall spring, fall spring. That would be great. We need someone working on this stat. Definitely. I’d donate to that Kickstarter. Last summer seems so long ago and also yesterday. Male is awfully good at mix tapes. His music collection is as big and diverse as mine if you can believe it. Well, it’s not really technically even a relationship. It’s ten years of complicated.